In a large bowl, combine green onions, Dijon mustard, garlic, sage, rosemary and half the salt and pepper. Add ground pork and mix. Shape into four patties. Brush onion slices with oil and sprinkle with remaining salt and pepper. Preheat the barbecue to medium-high gas. Put the pork pies and onion rings on the oiled grill and close the lid. Cook the pork pies for about 15 minutes or until they are no longer pink inside and onion for about 10 minutes or until it is softened (return pÃ¢tÃ©s and onion rings in mid-cooking). 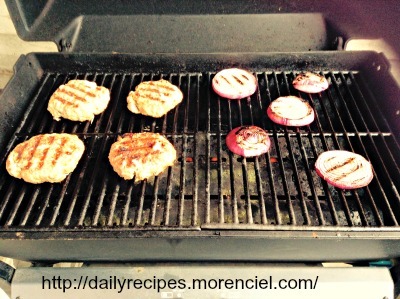 If desired, meanwhile, put the buns on the grill and cook for 2 minutes or until browned. Cover the pork pies of cheese, close lid and cook for about 1 minute or until cheese is melted. Put the pork pies in breads. 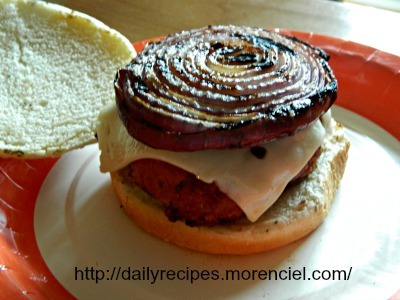 Top with grilled onion rings.